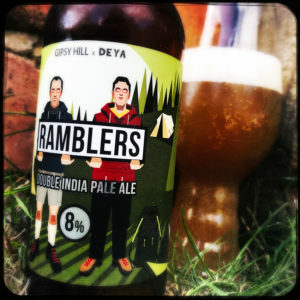 Brewed in collaboration with Deya, Ramblers is a great big Double IPA using a very fruity yeast and lots and lots of lovely hops. The beer pours a satisfyingly cloudy gold with a big foamy head and smells of melon and mango and honeysuckle. The body is thick and chewy, packed with sticky toffee, honey, wafers and brioche, the yeast adds an enormous pile of peach melba fun, while the hops – Mosaic. Azacca and El Dorado of you were wondering – make for a striking bitterness, lots of steely herbal leaves, mango, tangerine, redwood resin and a touch of rolling tobacco that push you headfirst into a fizzy sherbet, tuck shop sweetie finish. 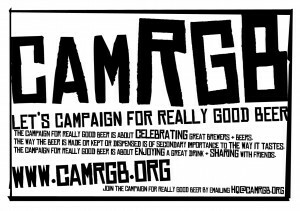 This entry was posted in Beer Review, CAMRGB and tagged 7.5% +, Beer, Beer Review, Bottle Conditioned, bottled beer, CAMRGB, DIPA, Double IPA, Drinking, IPA. Bookmark the permalink.